In 1966 the Doctor defeated the Great Intelligence, but he knew it wasn’t a final victory. And his companion Victoria, whose mind had once hosted the evil entity, might still fall prey to its power. Now it seems that his fears are justified. In a Tibetan monastery, the monks display unearthly powers - UNIT are investigating. A new university has opened in London with a secret agenda that may threaten the whole country. Victoria, abandoned in an age very different from her own, and haunted by visions of a father she refuses to believe is dead, is slipping into despair and madness. But are the visions which plague her really hallucinations? Or has the Great Intelligence once again made Earth its target for invasion? A novel featuring the Brigadier, Victoria and Sarah Jane, based on the original video drama. This adventure takes place after Victoria’s departure from the TARDIS in Fury from the Deep. It is an expansion of the video drama Downtime, also scripted by Marc Platt, and features unique photos taken during filming. Victoria uses her family fortune to found New World University, where the students are educated by computer. The Children of the New World are disparagingly referred to as “Chillys” by the mass media, but NWU has its own radio station where the DJ, Anthony, reads news and press releases slanted to present NWU in a good light. Victoria is trying to bring the light of truth to the world, but to complete her task she must find the Locus. To this end she hires investigative journalist Sarah Jane Smith to track down certain people who were involved in the mysterious “London Event” thirty years ago. Sarah is unnerved by the silent Chillys, who are constantly tuned in to Tibetan chants and techno beats on their personal stereos, but she becomes curious when she learns that, not only was central London evacuated thirty years ago, but that few can remember why. When she learns that most of the reports on this incident are classified and that her old friend Brigadier Lethbridge-Stewart was involved, she begins to suspect that Victoria and her smarmy “marketing facilitator” Christopher Rice aren’t all they seem. She thus claims to have come up empty, but when she leaves NWU she has K9 track down the Brigadier’s phone number and tries to warn him that he may be in danger. But her phone call is tapped -- and now Victoria knows where to find the Brigadier. NWU student Daniel Hinton, who was once expelled from Brendon School for dabbling with the occult, begins to suspect that something odd is happening at NWU. He thus hacks into the computer system, and finds that Victoria and Rice are seeking his former maths teacher, Lethbridge-Stewart. Before he can find out why, his computer seems to come to life; light blazes from the monitor, and web forms where the light touches his skin. Hinton tries to flee from the university, but he is chased to the roof of a building by Rice, an army of Chillys, and a silver sphere which Rice believes is an extension of the NWU computer. Hinton leaps from the roof to escape and inexplicably floats to the ground, where he is rescued by a tramp named Harrods. Harrods takes the unconscious Hinton to his hut, where the dreaming Hinton visits the astral plane -- which he has seen before, during seances -- and makes contact with the sleeping Brigadier, whom he warns to trust no one. The Brigadier awakens from very strange dreams to find that he’s slept for three days straight. The school secretary, “Twickers”, is concerned for his health, and she’s been getting odd telephone calls from people trying to contact him. When he checks his messages, he’s taken aback to find that his estranged daughter Kate has called him, claiming to be in some sort of trouble she doesn’t want to discuss over the phone; he also receives a coded message telling him to contact UNIT. Suspecting that he’s being watched, the Brigadier tries to slip away quietly, but he is nearly run down by a Porsche with tinted windows. Twickers drives the Porsche off the road, but the driver escapes before the Brigadier can identify him. The Brigadier sets off for London to keep his appointments, but finds the streets gridlocked due to a virus which is scrambling all of the city’s computer systems. As he waits for traffic to clear, he begins to have waking visions of Victoria, Daniel Hinton, and the Yeti, and he realises that the Great Intelligence is active once again -- but in what form, and what is its plan? The Brigadier abandons his car and continues on foot, trying to avoid the Chillys who seem to be clustering on the jammed street corners. Professor Travers reappears, his dead body animated by the crippled Intelligence, and attacks Hinton and Harrods. They flee and attempt to warn Daniel’s friend Anthony of the danger, but the phone line becomes clogged with static and the NWU computer locks Anthony inside his broadcast booth, which begins to fill with web. Anthony tries to broadcast a warning to the world, but Rice cuts the transmission and leaves him to be smothered by the web. Travers finally returns to Victoria’s office to claim his position as Chancellor, but the moment which should be the fulfillment of all of Victoria’s dreams brings only the understanding that she has been cruelly tricked. Travers does not bring the light of truth at all; she has served not him but the Intelligence, which requires only the final Locus for its new web to be complete. The Brigadier meets with UNIT’s Captain Cavendish, who claims that a hacker has been trying to break into UNIT’s systems but has apparently failed due to the widespread computer virus. Apparently trying to find out what the hacker was looking for, Cavendish asks the Brigadier about his early years in UNIT -- particularly whether he kept any souvenirs of his alien encounters. The suspicious Brigadier gives nothing away, and when he spots two Chillys approaching him with a pair of headphones he pulls a gun on Cavendish and makes his escape. He then meets with Kate, who explains that she’s being harrassed by the Chillys for some reason. As the Brigadier never told Kate or her mother about his real work with UNIT, she grew up alienated from him and is uncomfortable going to him for help, even now. She is about to leave when the Chillys who have apparently been following her arrive -- and attack the Brigadier, trying to force a pair of headphones onto his head. At the last moment, Hinton and Harrods arrive and drive the Chillys away. The Brigadier recovers on Kate’s houseboat, where she listens in disbelief as Hinton and the Brigadier compare notes on the Intelligence. It must be after one of the idols to which it had bound itself during its last attempt to invade London -- the Yeti models which still bind its power. Kate realises that she has the model in her toy chest; for years she thought it was just a harmless toy. The moment that Hinton sees the model, the houseboat is forced onto the riverbank by a telekinetic group of Chillys, and Hinton realises too late that he’s been used as a trap to locate the Locus. The silver sphere rolls into the houseboat, touches Hinton and transforms him into a Yeti, which seizes the Locus and takes it back to NWU. The Brigadier prepares to follow, but first must ask Kate why she has a toy chest aboard the houseboat. Shaken by what she’s seen, Kate finally admits that she has a son named Gordy, whom she sent to stay with friends when the Chillys’ harassment got to be too much. Taken aback, and near tears with pride, the Brigadier sets off to NWU with Harrods, realising too late that in his shock he’s forgotten his gun back on Kate’s houseboat. The Yeti which was Daniel Hinton arrives at NWU, and before Victoria can stop him, Rice takes the Locus and smashes it, thus restoring the Intelligence to full power. The computer has already spread its virus through the Internet, which now becomes the Intelligence’s new body. Meanwhile, Sarah contacts UNIT to warn them of her suspicions, and Brigadier Crichton discovers too late that Cavendish has stolen the hard copies of the reports on the earlier Yeti incident. Sarah accompanies the UNIT forces to NWU, but the soldiers are unable to use any weapons with computer chips in them, as the Intelligence can now turn those against them. The Brigadier and Harrods enter NWU to find the corridors -- and students -- draped with strands of web. Hinton’s spectre then appears to the Brigadier, explaining that when the Intelligence subsumed his body he astrally projected himself into the computer; now he can use it to guide the Brigadier through NWU. Kate finds the Brigadier’s gun and takes it to NWU, where Hinton contacts her and convinces her to let him use her body to type instructions into the NWU computer system. Unfortunately, the Intelligence detects the interference, erases Hinton from its hardware and sends the Yeti in Hinton’s former body to capture the Brigadier. Victoria tries to assert her authority over the Chillys, but they are now controlled by the Intelligence, and they take both her and the Brigadier prisoner. The Yeti kills Harrods with a single blow, and Victoria and the Brigadier are marched away to face the Intelligence as the skies over London begin to fill with web. The Intelligence transforms more Chillys into Yeti and sends them to fight the attacking UNIT troops. Sarah gets past the front lines into the grounds of NWU, where she and Kate find the Brigadier surrounded by Chillys and confronted by the possessed Cavendish and Travers. As the Intelligence gloats over its victory, the Brigadier sees Sarah nearby and loudly reminds the Intelligence that it has bound itself once again -- this time within the confines of the NWU computer. While the Brigadier distracts Travers, Victoria escapes and heads for the mainframe to shut it down. Sarah follows her, but finds Rice and the Yeti that was Hinton waiting for them; Rice has deactivated Victoria’s security clearance, and he orders the Yeti to kill both her and Sarah. Kate is captured by the Chillys, and the Intelligence prepares to savour the Brigadier’s ultimate defeat by turning his daughter into a Yeti. 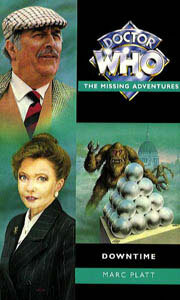 As the Brigadier struggles to hold back the silver sphere which has targeted her, Victoria appeals to whatever remains of Daniel Hinton within the Yeti’s body, reminding him of his meditation training. But it’s Rice’s taunting which finally pushes Hinton over the edge. The Yeti strikes Rice to the ground, killing him, and attacks the mainframe, triggering a chain reaction of explosions which destroys it. The Intelligence’s possessed victims collapse or die, and Travers’ body dissolves into a web which dissipates into thin air. The Intelligence has been defeated at last. In the aftermath, Victoria slips quietly away as the Brigadier and Sarah compare notes and realise who she really was. Kate now understands that her father’s secret job involved saving the world, and she introduces him properly to his grandson, Gordy -- whom she named after him. Gordy in turn tells the Brigadier that he has a new invisible friend named Daniel. Victoria is later contacted by a white-haired man in a frilled frock coat, who claims that he is also called “the Doctor”. He apologises for not having looked her up before, and gives her a letter of recommendation which will clear her reputation with UNIT. She is at peace at last. The novelisation also features cameo appearances by Brigadier Crichton, from The Five Doctors, and Captain Bambera, later to become Brigadier herself by Battlefield.